A little blog update for you guys. I’m in mid manic-ness with getting the next wedding cake ready for sunday, but I thought I’d post a recipe for the banoffee cupcakes I made today. I even found those cool retro foam banana sweets from a local farm shop! Yum! 1) Preheat oven to 160 degrees (fan assisted) and prep cupcake cases into a tray. 2) Cream the butter and sugar together until light and fluffy, then add the eggs. 3) Sift in the flour and baking powder. 4) Mix in the mashed banana and vanilla. 5) Add milk and combine all together. 6) Scoop the mixture into the cupcake cases and put in the oven, baking for around 18-20 minutes. 7) Test with a skewer to see if it comes out clear. If it does, take out and cool on a rack. If not, bake for a little longer. Pre-made caramel (Carnation) – to taste. Whisk the cream until it forms stable peaks, then fold in the caramel. I used quite a lot because I think its so yummy, but I just suggest you put in as much as you want. Its a preference thing! Pop a very little amount of caramel sauce on top of the cooled cupcake. Put the cream/caramel topping into a piping bag with your choice of nozzle. Pipe your topping onto the cupcake and pop in the fridge to set a little. 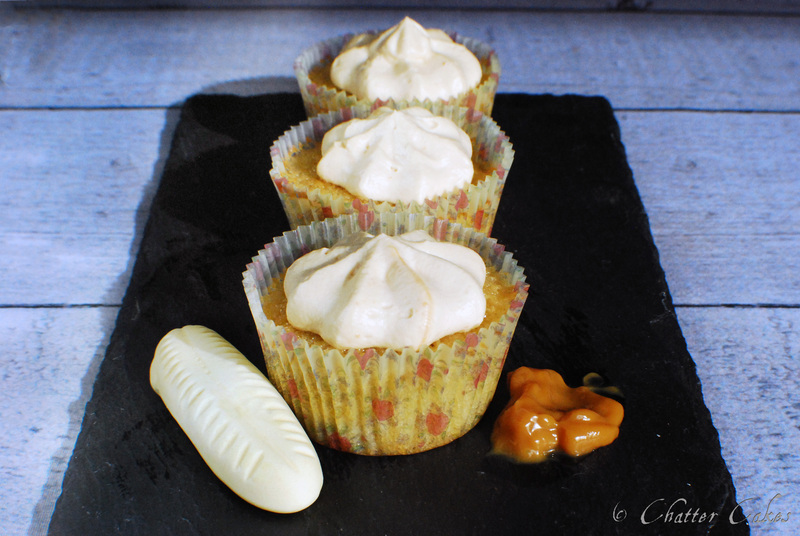 Serve with the foam banana sweets if possible – they go well!! An utterly A1 recipe. How much do I love being one of your cake tasters? QUITE A LOT!!! Thank you 🙂 they are very easy to make!